My cool weather, early spring crops have been going gang busters this year. We've had an unseasonably warm (HOT!) past few weeks. While the warmth has been nice, the hand watering has been a bit of a chore. The Olympic spinach is thick and full, ready to bolt soon I'm afraid. We've enjoyed plenty of spinach salads but there is more ready now than I know what to do with. I'll be looking for ways to preserve the spinach this upcoming week. The spinach, sweet pea's and swiss rainbow chard in this box was all sown in mid-Feb. 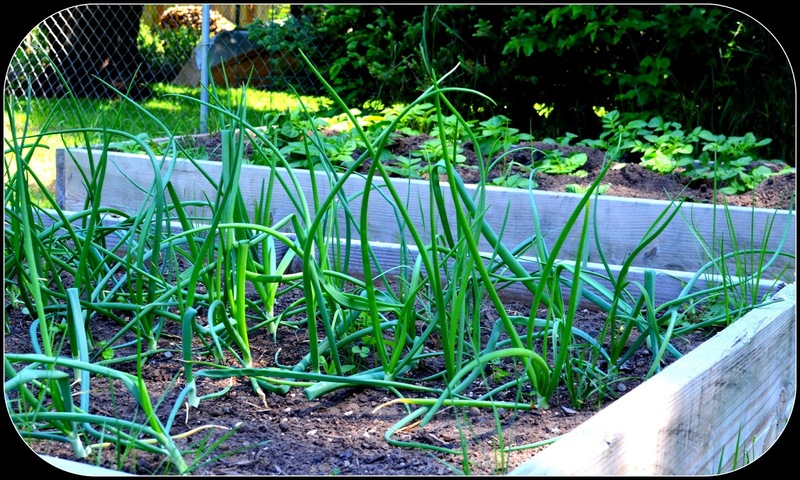 The three varieties of onions I am growing are amazing me with how much they have grown in a little over a month's time. 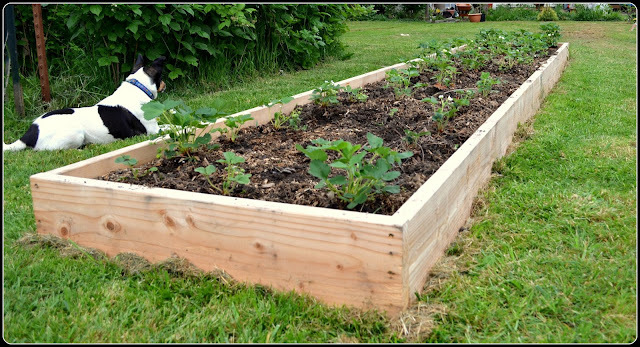 I expect them to be done sometime in June and at that point, I may start another box from the seeds I've sown in my mini green house. The current onion starts were given to me from Alison and I planted them sometime in late March. They were very healthy, large, onion sets to begin with. Cascade Snow Pea's in the forefront here, are beginning to flower. The stems are very sturdy and I'm happy they are performing so well. Seeds were directly sown in mid-February. I have been growing two types of potatoes. Reds and Yellows. I have hill'd them three times thus far. In the past I have only grown potatoes in pots with mediocre results. I've given them full use of one raised bed and they seem to be thriving. Home grown potatoes are incredibly tasty. The strawberries are in their first year. The bed will continue to fill out as the years progress. They are producing, but it will be a light year. 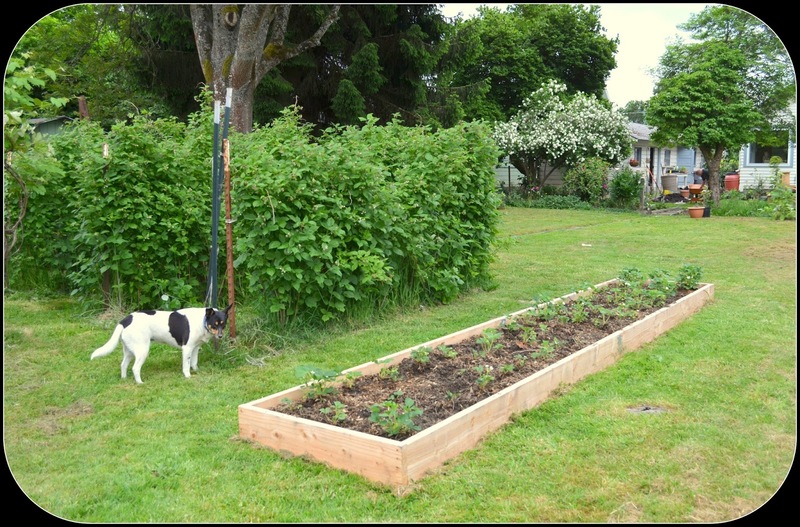 I added compost at the end of March and the berry plants have been quite content. During the first year, I am less concerned about berry production than I am with allowing the plants themselves to mature and strengthen. On the other side if the strawberry box are the established heritage raspberries. They are heavy with blossoms this year. The mason bee's are hanging out and having a good time in our four rows of raspberries. I expect a bumper crop this year. These raspberries usually have two significant harvests every season. This week we have four more raised beds getting built and I'll be hauling dirt to fill them up. Tomatoes, peppers, cucumbers, squash, pumpkins and watermelon will be enjoying what has been a warm growing season thus far. It's busy times here at the cottage. I'm happy to see my gardens grow and thrive. It makes this place feel more like home. 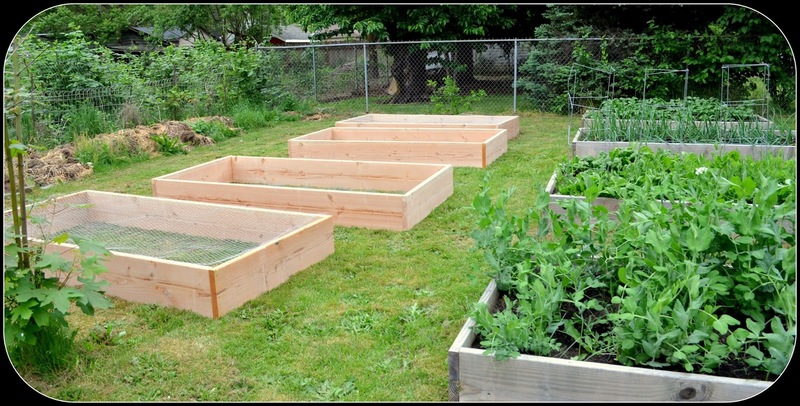 I love your raised beds! 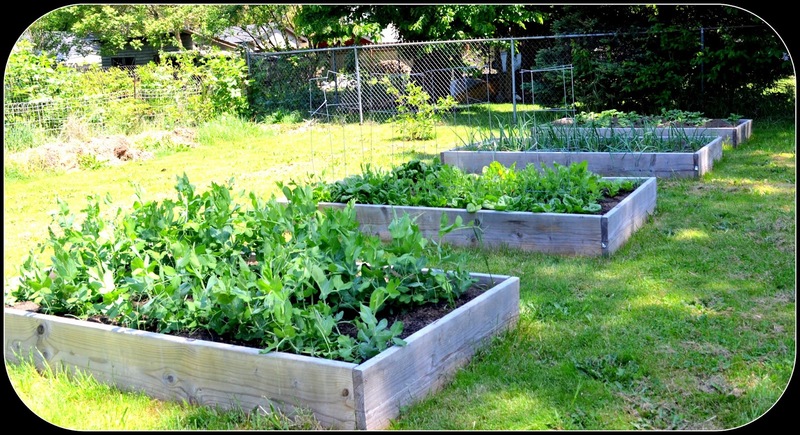 While I'm glad that I have room for a large "regular" garden, I think raised beds are much tidier looking, and I suspect that they're also a bit easier to care for. Your veggies look quite happy! Enjoy! Our weather has gone downhill again so I suppose everything will slow down again. Wow! You are on the ball this spring. We are a little behind this year, but excited to be adding an "only strawberries" planter. We added raspberries as well. Did you install a barrier to keep them from running? 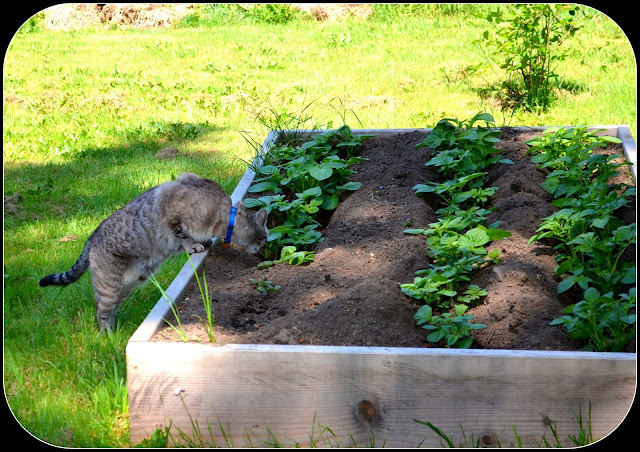 Your garden is shaping up to be as yummy as it is beautiful. I enjoyed Alison's post with photos of your garden too...and just when I was thinking it impossible to photograph a black cat, she proved me wrong. 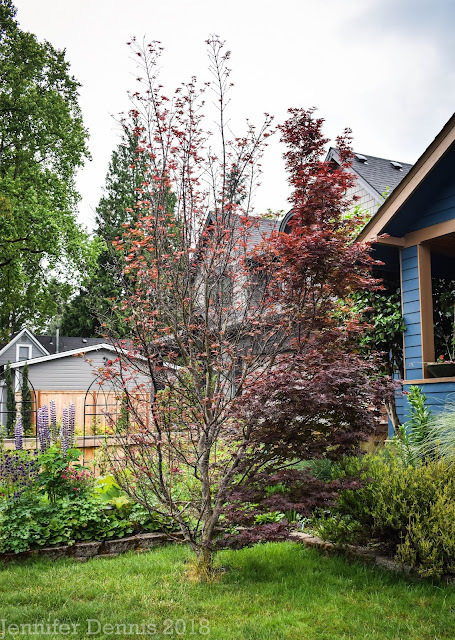 I'm south of you in the San Francisco Bay Area and, sadly, I never really did find a good slice of cool winter weather to get in my cool weather garden. 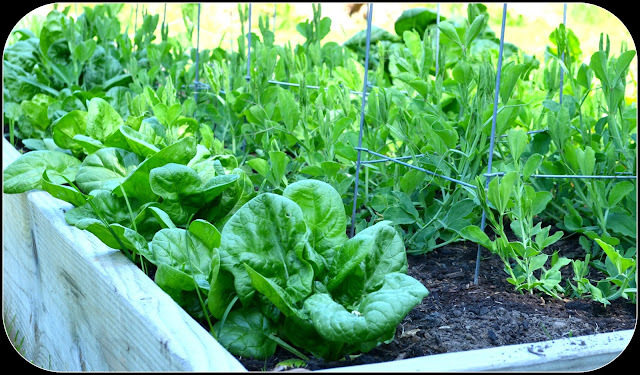 So I'm really drooling over your lovely spinach, lettuces and onions. Hopefully, next year's temps will be more cooperative. Enjoy your bounty! I got a kick out of reading that you could sow anything in Feb...lol. Here we were under a few feet of snow. Love the shots of your garden pets. And all of your gardens look wonderful. Oh how exciting to have so many more beds to fill! :) My husband keeps expanding my veggie garden each year so far, too. I just can't seem to get enough. Still not enough space for pumpkins, probably. Maybe next year. I'm growing spinach for the first time this year. My kids have taken to eating it straight out of the garden. If I had known that would happen, we would have planted it years ago! I wonder if you could freeze it, like herbs--just wash the leaves, put them in a bag, and freeze. Might be worth a try.